Trial strategy is a game that requires its players to read between the lines. When a lawsuit is initially filed, the plaintiff asks for the sun, moon and stars. Similarly, when defendants respond, they'll typically raise 30+ defenses without any intention of presenting all of them at trial. Every claim or defense runs the gamut of strong to weak to pipe dreams. But, those claims need to be raised because lawyers never want to waive (legal translation: lose the claim because you didn't raise it). They also don't want to tip their cards to the other side. It's similar to quarterbacking a team. The defense is showing blitz, but those linebackers look like they're about to start back-peddling. Reading between the lines, it's probably a standard cover defense. Knowing this, to succeed, trial lawyers (like quarterbacks) need to discern their adversaries' real positions, and quickly. And a great place to test this skill out is with a seemingly bizarre cease-and-desist email the University of Wisconsin sent out this week. Susan Lulgjuraj recently reported on Beckett that Wisconsin contacted at least one eBay seller, telling them to stop selling Russell Wilson baseball cards. Wilson is a dual athlete. He's a quarterback with the University of Wisconsin as well as a second baseman in the Colorado Rockies organization. 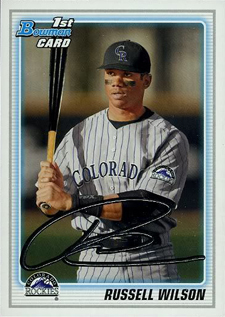 Topps put Wilson on several cards in 2010 Bowman Draft and 2010 Topps Pro Debut. So far, everything seems legitimate. Dual athletes are legal so long as there is no overlap with sports (can't be both a pro and an amateur in baseball at the same time). It's also OK to have trading cards of college players (if certain hoops are jumped through). NCAA rules (Bylaw 12.5.2.2) prohibit the use of a student-athlete's name or picture to advertise, recommend, or promote directly the sale or use of a commercial product or service of any kind. Therefore, as is required under NCAA rules, I am writing on behalf of the institution to demand formally that you immediately cease and desist the use of this advertisement in order to protect the eligibility of the student-athlete. Please be advised that NCAA regulations prohibit you from using the name, picture, or any likeness of any current University of Wisconsin-Madison student-athlete in any commercial manner. Legal translation - Basically, “We demand that you stop selling this card in the way that you are selling it or we're going to do something vague to you." What the heck? A player can have a baseball card, but you can't sell it? How does that work? File this one under, “Don't hate the player, hate the game." And in this case, the player is not Wilson, it's Wisconsin. And the game is not baseball, it's the NCAA bylaws. If a student-athlete's name or picture appears on commercial items (e.g., T-shirts, sweatshirts, serving trays, playing cards, posters, photographs) or is used to promote a commercial product sold by an individual or agency without the student-athlete's knowledge or permission, the student-athlete (or the institution acting on behalf of the student-athlete) is required to take steps to stop such an activity in order to retain his or her eligibility for intercollegiate athletics. Legal translation: If a player's name or image is used on a product or is used to try to sell something without the player knowing about it, the student/university must try to stop those activities even if the student/university has nothing to do with that activity. The consequences of the student/university not trying would be the player could lose his or her eligibility. Keeping this in mind, the focus of the cease and desist letter is on the advertising. It appears the baseball card is legitimate. Topps (likely) did not use an image of this card in its advertisements, so Topps didn't use promote a product with the player's name or likeness. The problem (that is the problem that the NCAA bylaws create) is if you want to sell this card, you need to reference the player's name. Technically, then, someone is violating this bylaw. Given that there is a technical violation of an NCAA bylaw, and the potential outcome of this violation is the loss of eligibility of a player, Wisconsin needs to do something. Legal translation: The rule requires the university to do something, anything, to try and stop this activity, even if what is being asked to do is silly, or futile. Otherwise, it risks losing its player. Reading between the lines, this is probably what's really going on (of course, if the card itself isn't on the up and up, that's a whole different matter. But, again, that doesn't look like it's the problem. Can Wisconsin or the NCAA take actual legal actions against the eBay seller? Doubtful, unless the seller is an NCAA athlete. Can it force the seller to stop selling the card? Again, not likely. But that's not the real point. The real point is that by doing something, Wisconsin believes it is preserving Wilson's eligibility. So, while Wisconsin may be showing blitz here, it's actually playing cover. Before you jump all over Wisconsin, remember, the NCAA rules are not the clearest. The university really is (kinda) doing something right—it's trying to keep Wilson's NCAA eligibility because of what it perceives to be a potential violation (one that is completely out of its control). Sure, it looks like it is engaging in what looks to be a fairly ridiculous and overbearing play, but the consequences if it doesn't act like this could be extreme. So, don't hate the Wisconsin, it's playing by the rules. This is ridiculous. If sellers aren’t a part of the NCAA then why should they abide by NCAA bylaws? They have no authority here. Sell, sell, sell!